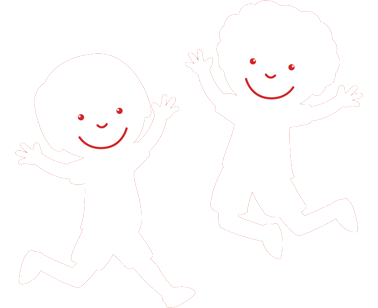 Trust Melrose to make your kids smile. 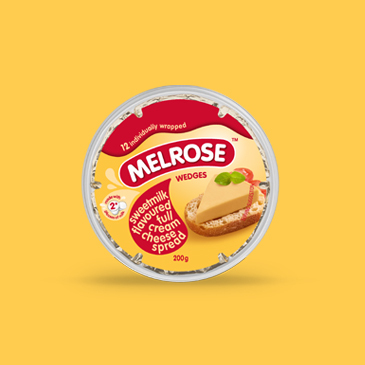 With its perfect match of nutrition and convenience, Melrose is a cheese treat loved by children of all ages. 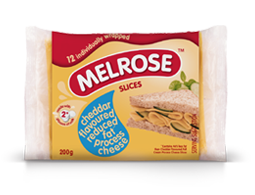 Melrose has been trusted by South African mums for nearly seven decades. The products are all made from the real stuff, only A-grade Cheddar and Gouda. Melrose contains bone-building calcium and protein, both so essential to growth. Our trusted and deliciously creamy range offers plenty of fun and convenient options and includes spreads, wedges, slices, blocks, portions, and the all-new Melrose Melts range. 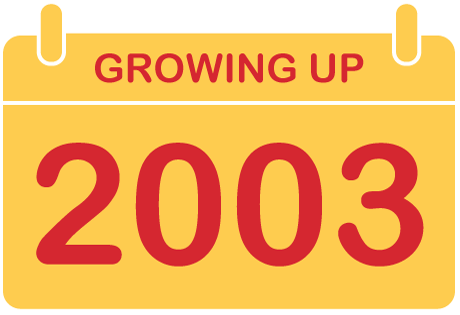 Whether it’s a lunchbox Melrose treat that will make their day, a quick and tasty snack, or a sandwich ingredient to fill the hunger gap, we’re proud of making kids and their taste buds, SMILE! 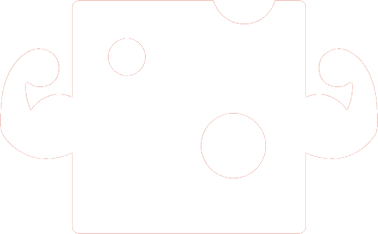 Cheese is one of the most easily absorbed and concentrated sources of calcium, which is vital in the maintenance of healthy teeth and bones. Cheese is also an excellent source of protein, essential for building and maintaining all of the body’s structures such as muscles! 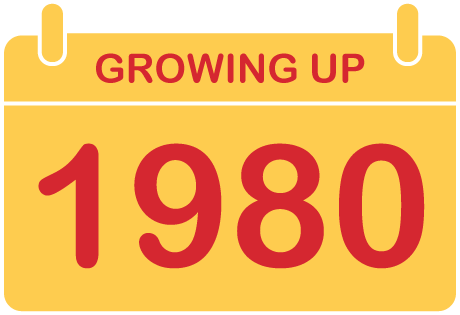 With Melrose products, you can be rest assured that kids are only getting natural lactose sugar and no added sugars. 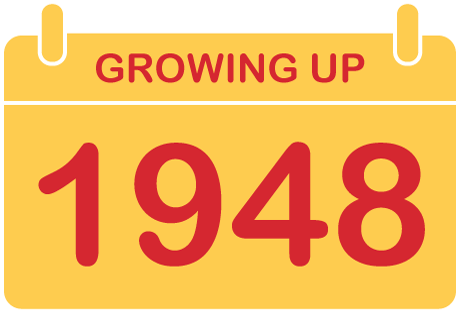 The Melrose brand’s history dates back almost 70 years. 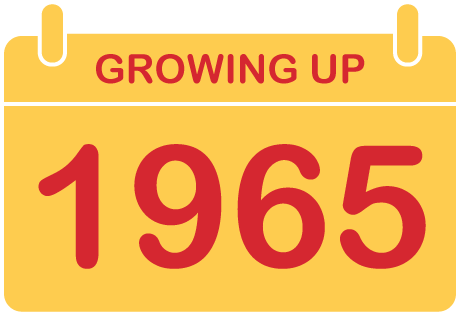 It has maintained the #1 cheese brand position for kids, offering an array of delicious spreads, slices, wedges, portions and blocks. 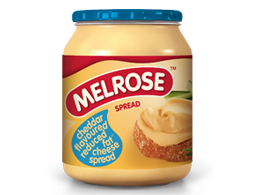 A jar of smooth, creamy Melrose Spread is a well-loved staple in all fridges. Keep a backup in the cupboard to make sure 'mum remembered.' 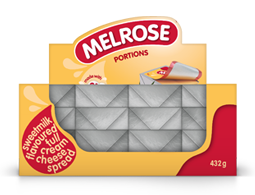 Melrose Spread is easy to use and provide many smiles and thoughts of mum in lunchboxes. And it's just as great to use in food to cheese up the flavour. The spread comes in re-sealable 250g and 400g glass jars, because sometimes you use a lot and other times not so much when the kids are demanding their wedges. 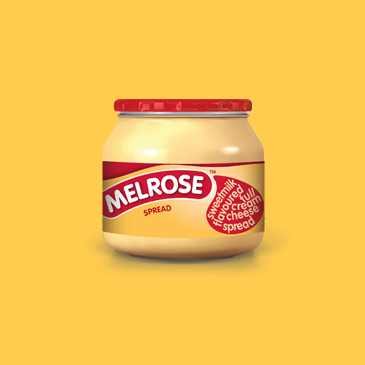 Spread savvy: it takes 6 glasses of milk to make 400g Melrose Spread. Sweetmilk flavoured full cream cheese spread. Ingredients: Cheese (cow’s milk, salt, calcium chloride, selected cheese cultures, non-animal rennet), Water, Butter (cream, acidity regulator), Corn syrup solids, Reconstituted milk solids (whey), Emulsifying salts, Thickeners, Preservatives (potassium sorbate, nisin), Flavouring, Colourant. Ingredients: Cheese (cow’s milk, salt, calcium chloride, selected cheese cultures, non-animal rennet), Water, Butter (cream, acidity regulator), Reconstituted milk solids (whey), Emulsifying salts, Thickeners, Flavouring, Salt, Preservatives (potassium sorbate, nisin), Acidity regulator, Colourant. Ingredients: Cheese (cow’s milk, salt, calcium chloride, selected cheese cultures, non-animal rennet), Water, Butter (cream, acidity regulator), Reconstituted milk solids (whey), Emulsifying salts, Thickeners, Texturised vegetable protein, Flavouring, Salt, Preservatives (potassium sorbate, nisin), Acidity regulator, Colourant. Ingredients: Cheese (cow’s milk, salt, calcium chloride, selected cheese cultures, non-animal rennet), Water, Reconstituted milk solids (cow's milk, whey), Emulsifying salts, Thickeners, Flavouring, Salt, Preservatives (potassium sorbate, nisin). You’re pressed for time and those lunchboxes still have to be packed. 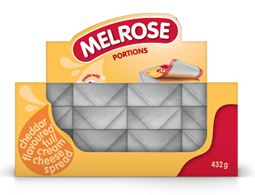 No worries, versatile and convenient Melrose Wedges have snack superpowers to sort it all out. 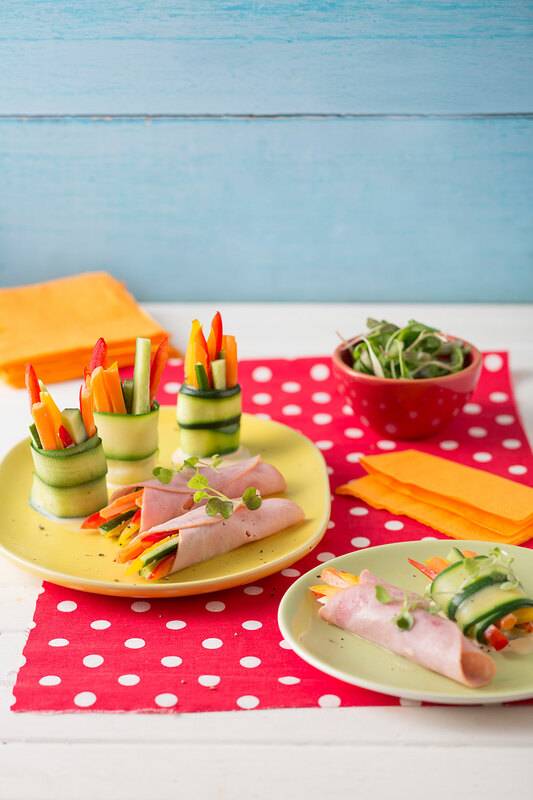 Made from cheese, the fun cheese triangles are perfect on the go and easy snacks to spoil the kids and everyone young at heart who loves a cheesy treat. 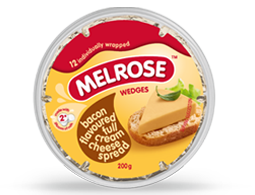 Melrose Wedges are available in a variety of flavours, as well as reduced fat options. Melrose Wedges are available in 200g packs. Ingredients: Cheese (cow’s milk, salt, calcium chloride, selected cheese cultures, non- animal rennet), Water, Butter (cream, acidity regulator), Reconstituted dried milk solids (whey, casein), Emulsifying salts, Thickener, Salt, Preservatives (potassium sorbate, nisin), Acidity regulator, Colourant, Flavouring. Ingredients: Cheese (cow’s milk, salt, calcium chloride, selected cheese cultures, non-animal rennet), Water, Butter (cream, acidity regulator), Reconstituted dried milk solids (whey, casein), Emulsifying salts, Texturised vegetable protein, Thickener, Salt, Flavouring, Preservatives (potassium sorbate, nisin), Acidity regulator, Colourant. Ingredients: Cheese (cow’s milk, salt, calcium chloride, selected cheese cultures, non-animal rennet), Water, Reconstituted dried milk solids (whey, cow's milk, casein), Emulsifying salts, Thickener, Salt, Flavouring, Preservatives (potassium sorbate, nisin), Acidity regulator. 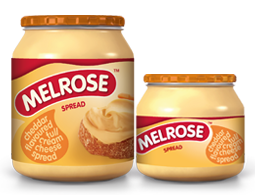 Time is always an issue, not to mention the daily demands of packing great-tasting, good-as-gold snacks – smooth and creamy Melrose Portions to the rescue! 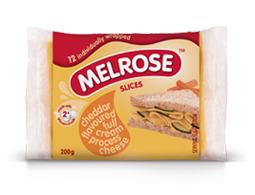 Made from choice-grade Cheddar and Sweetmilk, Melrose Portions are available in packs of 12 and 24. All portions are individually wrapped as 18g servings. 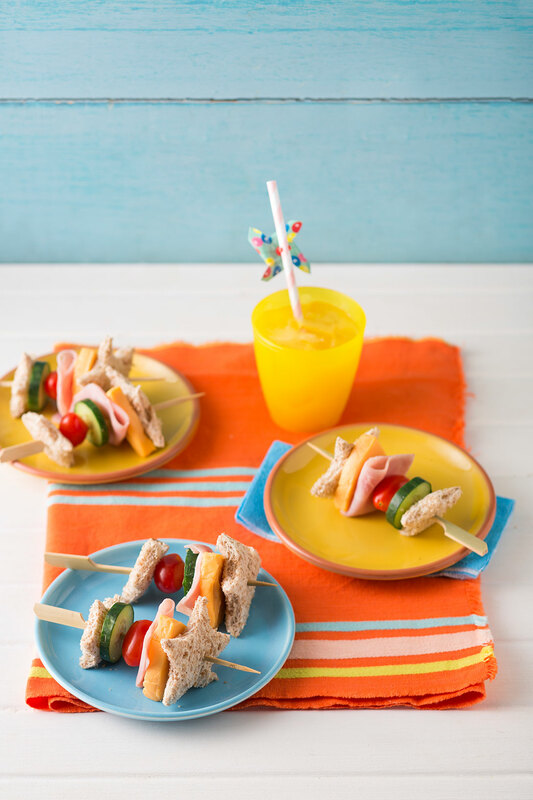 It’s as easy as 1-2-3 to pack in lunchboxes for enjoying on its own, adding to picnic baskets to use as a creamy sandwich spread, or to provide as a quick treat for keeping hungry bellies satisfied. 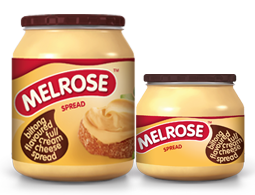 Melrose Portions are available in 432g and 216g packs. Ingredients: Cheese (cow’s milk, salt, calcium chloride, selected cheese cultures, non- animal rennet), Water, Butter (cream, acidity regulator), Reconstituted dried milk solids (whey, casein), Emulsifying salts, Flavouring, Thickener, Salt, Preservatives (potassium sorbate, nisin), Acidity regulator, Colourant. Melrose Slices, a truly magical treat. 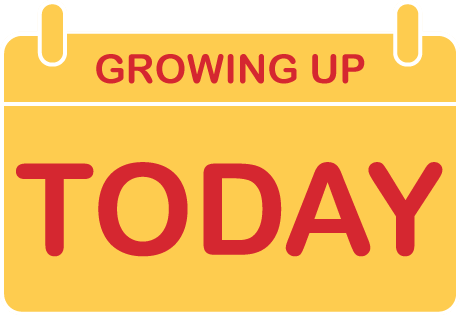 Already sliced in easy-to-open individual wrappers, making sandwiches has never been easier; even a kid can do it. 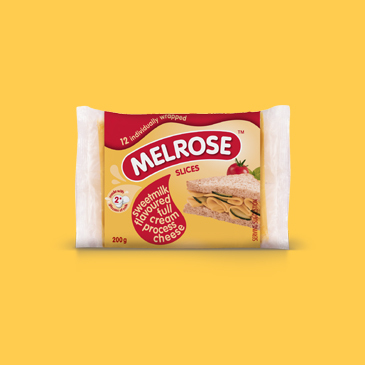 Melrose Slices are also great for picnics and a day out with the family - open the wrapper and pop a Melrose Slice onto a roll or slice of bread. 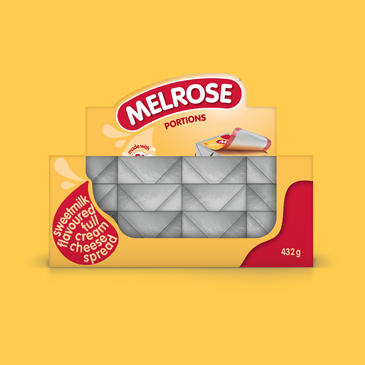 Melrose Slices are available in handy 200g and 400g packs. Ingredients: Cheese (cow’s milk, salt, calcium chloride, selected cheese cultures, non-animal rennet), Water, Butter (cream, acidity regulator), Milk solids (whey, cow’s milk), Emulsifying salts, Stabilisers, Salt, Preservative (potassium sorbate), Flavouring, Colourant. Ingredients: Cheese (cow’s milk, salt, calcium chloride, selected cheese cultures, colourant, non-animal rennet), Water, Butter (cream, acidity regulator), Milk solids (whey, cow’s milk), Emulsifying salts, Stabilisers, Salt, Preservative (potassium sorbate), Flavouring, Colourant. 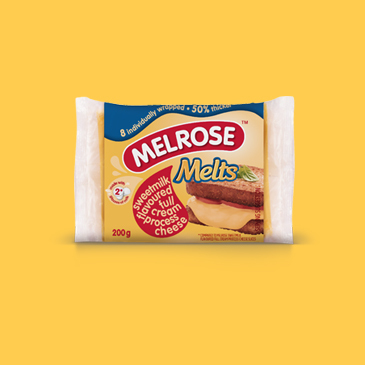 Imagine a thicker Melrose Slice, full of flavour, made to melt and simply ooze out of a tasty toastie. Fortunately there’s no need to imagine with an easy way to make your toastie dreams come true. 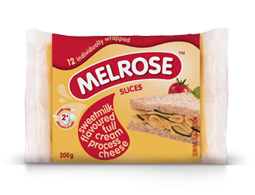 Melrose Melts offers a smooth and creamy slice that’s 50% thicker than standard Melrose Slices for the ultimate toasted cheese ‘sarmie’, an all-time favourite snack for kids. 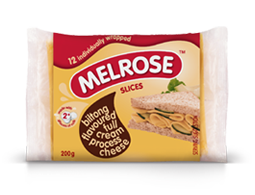 Melrose Melts offer the same convenience you love and expect from the trusted Melrose Slices range. 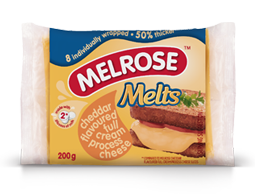 Melrose Melts are available in a 200g and 400g pack with individually wrapped slices. 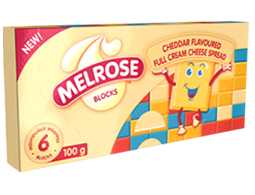 Melrose Blocks is the exciting, anytime cheese snack brought to you by the number one South African cheese brand. 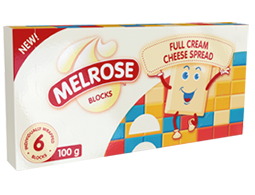 Melrose Blocks are a creamy and nutritious snack made from cheese and fresh butter. These bite size snacks comes in two variants, full cream and cheddar flavor. 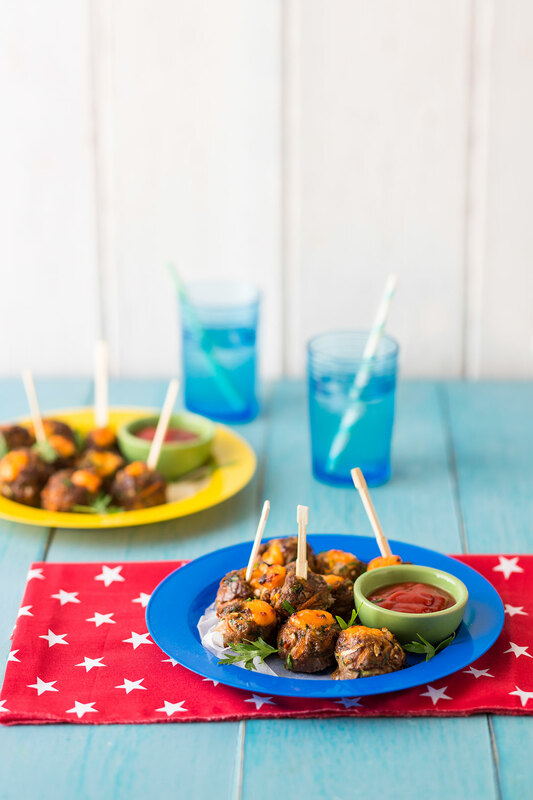 Kids will love the creamy taste and bright packaging, while moms will love the easy, convenient snack that can just be popped into the lunchbox. Melrose Blocks are available in 100g packs. Ingredients: Cheese (cow's milk, salt, calcium chloride, cheese cultures, colourant, non- animal rennet), Water, Butter (cream, acidity regulator), Reconstituted dried milk solids (cow's milk, whey), Emulsifying salt, Salt, Stabilisers, Preservatives (potassium sorbate, nisin), Acidity regulator,Flavourings, Colourant. Combine the beef mince, onion, garlic, zucchini, carrots, egg and parsley in a large bowl. Season with salt and black pepper to taste. Roll the mince mixture into bite-sized balls. Place them on a roasting pan. Press a little hole in the middle of each meatball and press a strip of Melrose Sweetmilk Wedge into the cavity. Drizzle with olive oil. Roast in the oven for 20 - 25 minutes or until golden brown. Serve warm or at room temperature. Preheat the oven to 180°C. Line a 12-cavity muffin pan with 1 slice of ham in each. 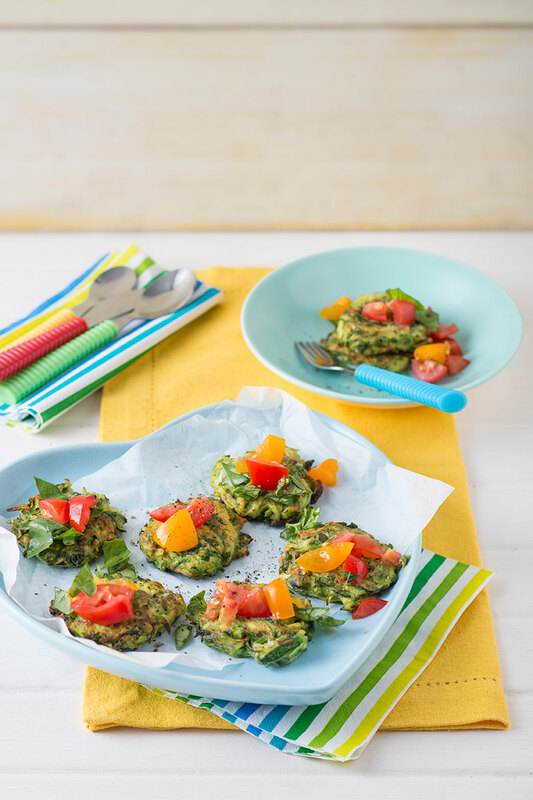 Divide some baby spinach, zucchini, peas and cherry tomatoes between each ham-lined muffin hole. Whisk together the eggs, cream, Melrose Sweetmilk Spread and parsley in a jug or medium-sized bowl. Season with salt and black pepper. Divide the custard mix between the muffin cups, pouring it carefully over the ingredients. Bake in the oven for 20 - 25 minutes or until golden brown and puffed up. Serve warm or at room temperature. Cut the pita breads using an 11 cm diameter cookie cutter and slice them through horizontally. Place them onto a large baking tray. Heat the olive oil in a large frying pan over a medium high heat. Fry the onion and garlic for 5 minutes or until softened. Add the whole peeled tomatoes, pressing them fine with a fork. Bring to the boil, lower the heat and simmer for 10 minutes. Add the basil and season with salt and black pepper. 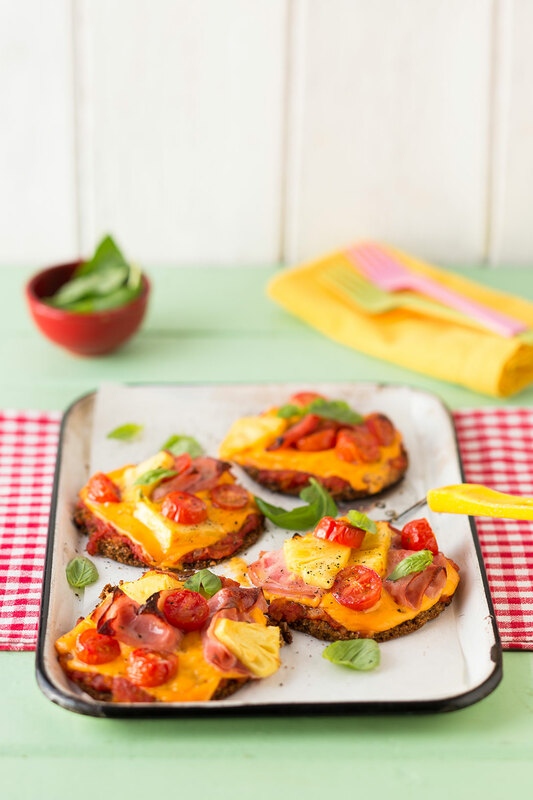 Spread the cooked tomato sauce evenly over each pita bread.Top with cherry tomatoes, Melrose Sweetmilk Wedges, pineapple and ham. Bake in the oven for 10 minutes or until golden brown. 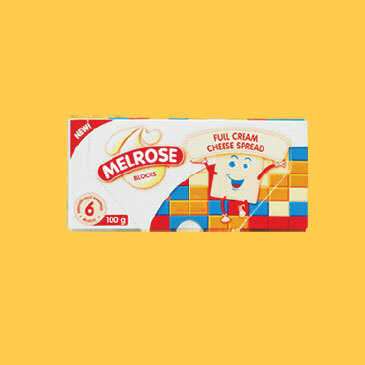 Whisk the oil, milk, eggs and Melrose Sweetmilk Spread together. In another bowl, mix the dry ingredients and make a hole in the centre. Add the egg mixture and mix using a spatula or spoon to form a smooth batter. Leave to stand for at least 10 minutes. Heat a little oil in a pan and drop spoonfuls of the batter onto the hot surface. When bubbles rise to the surface of the crumpets, turn them over and cook on the other side, until golden brown and cooked through. 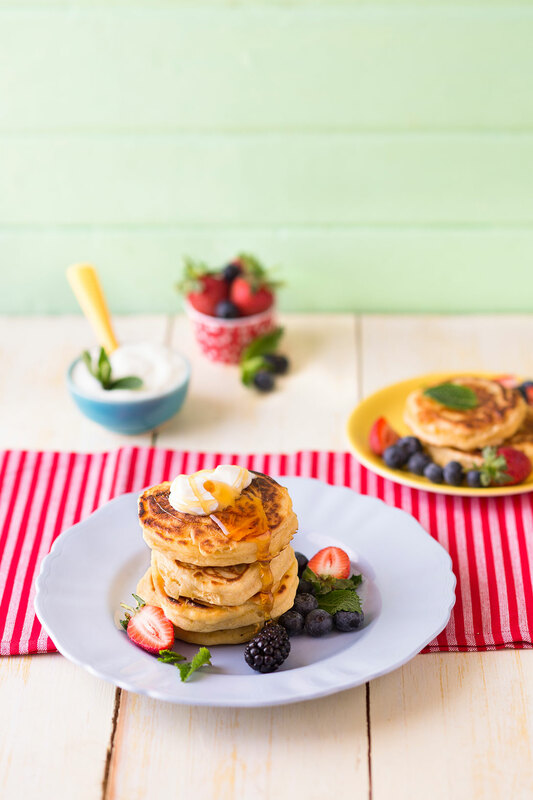 Serve the crumpets warm with fresh berries and double thick cream. Place the cake flour in a shallow bowl, seasoning with salt and black pepper. Whisk the milk and Melrose Sweetmilk Spread in another shallow bowl. Place the crushed cornflakes into a third shallow bowl. Dip the hake fillets into the cake flour. Shake off any excess flour. Dip the hake fillets into the Melrose Sweetmilk Spread, followed by the cornflakes, turn around until well coated. Heat up a 10 cm layer of the sunflower oil in a deep frying pan over a medium high heat. Shallow fry the fish fingers for 5 minutes on each side or until golden brown. Remove from the pan and drain the fish fingers on paper towel. For the coleslaw: Combine the cucumber, cabbage, carrot, olive oil and lemon juice together in a medium sized bowl. 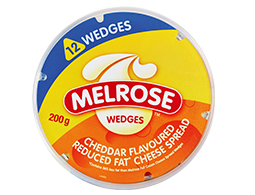 For the Melrose cheese dip: Combine the Melrose Sweetmilk Spread, sour cream and sweet chilli sauce together in a small bowl. 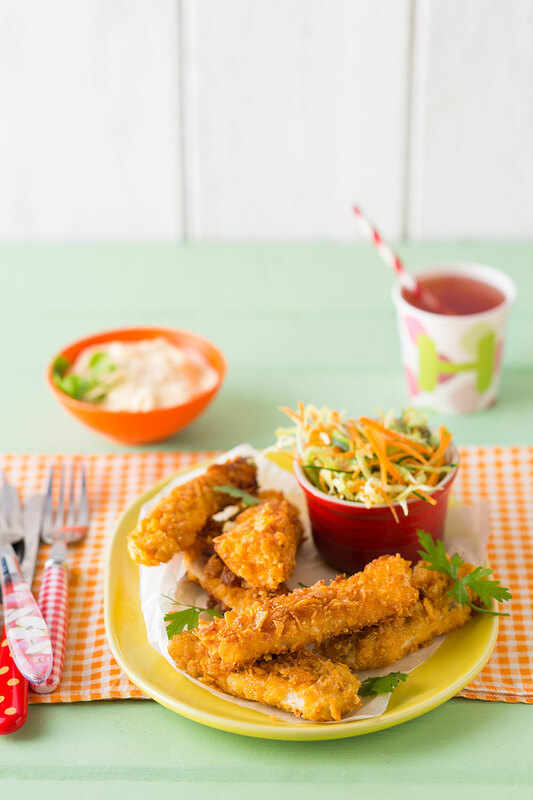 Serve the fish fingers with the coleslaw and dipping sauce. 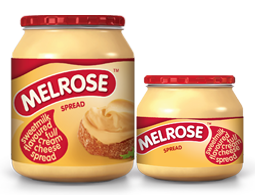 Combine beef mince, garlic and Melrose Sweetmilk Spread in a large bowl. Season with salt and black pepper. Divide the beef mixture into 6 and shape into flat patties. Heat the olive oil in a frying pan over medium high heat. Fry the beef patties for 8 - 10 minutes on each side or until golden brown and cooked through. 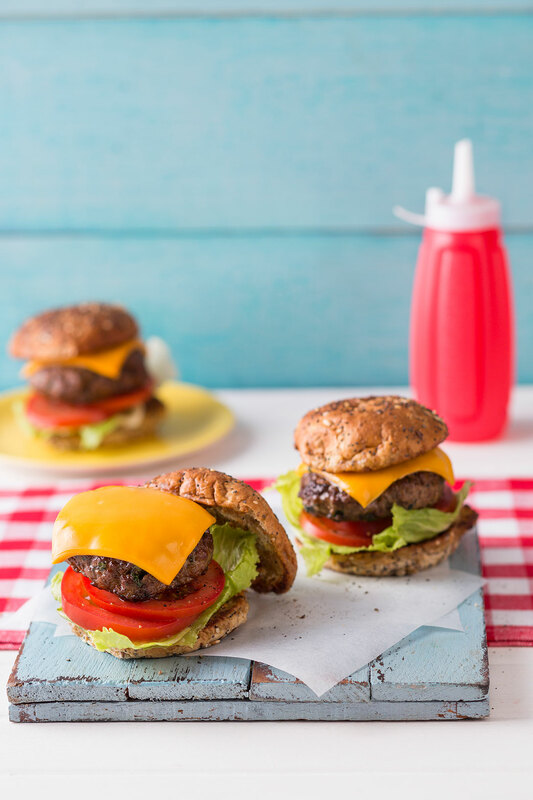 Top the seeded buns with iceberg lettuce, tomato, beef patties and individual slices of the Melrose Sweetmilk Melts. For the Mexican tomato salsa: Cut corn kernels off the cob. Combine the corn kernels, cherry tomatoes, red onion, red, green and yellow peppers in a small bowl. Season with salt. For the guacamole: Mash the avocado fine with a fork. Add the lemon juice and season with salt and black pepper. 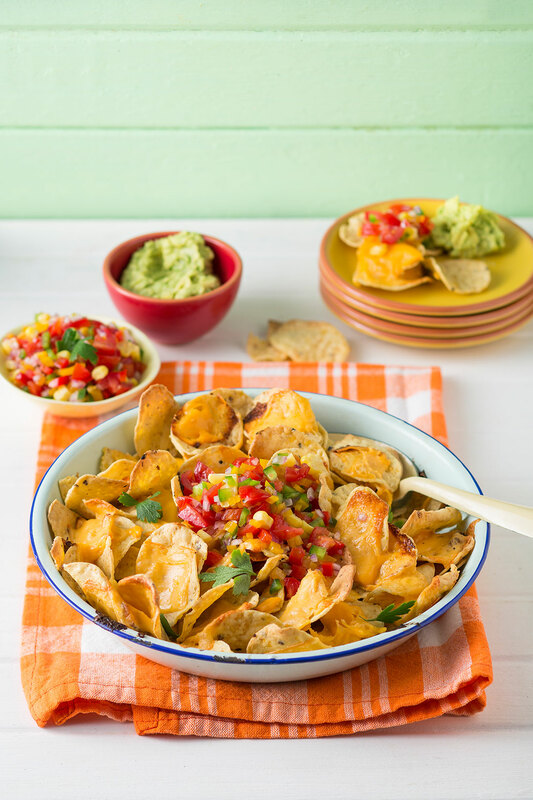 Place nachos onto a flat ovenproof dish or pan. Top with Melrose Sweetmilk Melts. Cover the oven dish with foil. 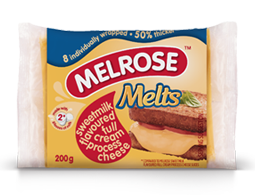 Bake in the oven for 5 - 7 minutes or until the Melrose Sweetmilk Melts have completely melted. Serve the nachos with the Mexican salsa and guacamole. Bring a saucepan of salted water to the boil. Cook the zucchini ribbons for 10 seconds in the boiling water, drain and pat dry with paper towel. Combine the red pepper, yellow pepper, carrot and cucumber in a large bowl. On a clean work surface, lay 2 ribbons together slightly overlapping one another. 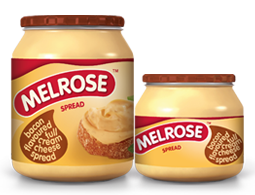 Place a dollop of the Melrose Sweetmilk Spread onto the edge of the zucchini ribbons. Place a small handful of the salad mixture on top of each zucchini ribbon. Roll the zucchini ribbon up tightly. Repeat with the remaining zucchini ribbons and do the same with the ham slices. Using a 5 cm star-shaped cookie cutter, cut six stars out of two slices of the bread. Thread one bread star onto each skewer stick. Cut a further six stars out of the remaining 2 slices of bread using a 7 cm star-shaped cookie cutter and set aside. Thread a cherry tomato, cucumber slice, ham slice and Melrose Sweetmilk Wedge onto each skewer, ending with one 7 cm bread star. Combine the chutney, tomato sauce, honey, Melrose Sweetmilk Spread and garlic in a large bowl. Season with salt. Place the chicken fillets on a clean chopping board. Place a piece of plastic wrap on top. Bash the chicken fillets with a meat hammer or rolling pin. Slice the chicken into strips. Add the chicken to the Melrose mixture and toss until chicken is well covered. Marinate for 1 hour. Thread the chicken strips onto 12 skewers. 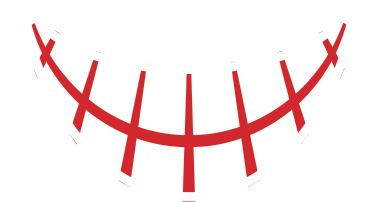 Heat a grill pan over medium high heat. 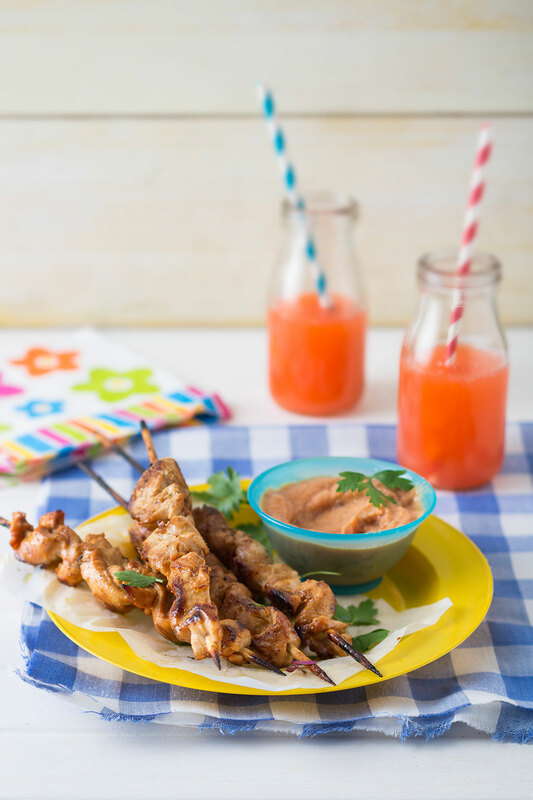 Grill the skewers for 6-8 minutes on each side or until golden brown and cooked. Combine the grated zucchini, self-raising flour, spring onion, garlic, Melrose Cheese Spread, parsley and salt in a large bowl. Heat the olive oil in a large non-stick frying pan over medium high heat. Drop tablespoonfuls of the mixture onto the pan surface and fry for 2 minutes on each side or until golden brown. Top with fresh chopped tomatoes and basil. Preheat the oven to 200°C. Line a muffin pan with 6 cupcake papers. 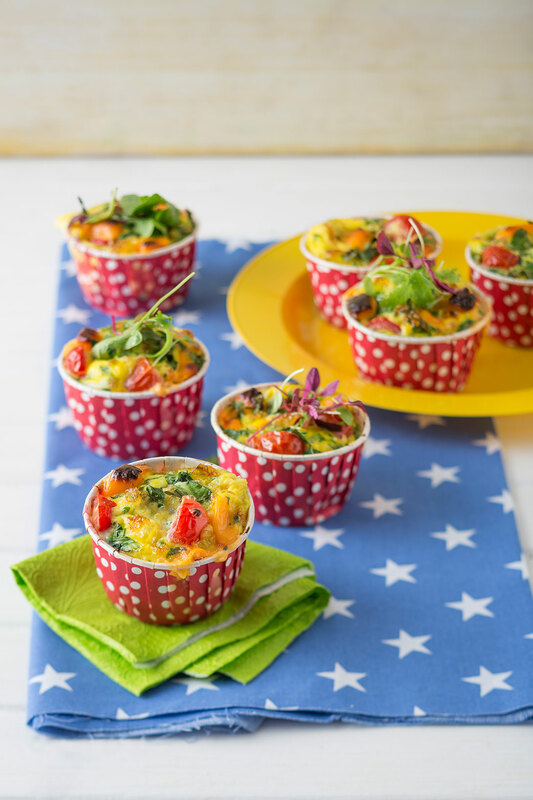 Divide some of the spinach, zucchini, cherry tomatoes and sweet corn between the 6 lined muffin cavities. Whisk the eggs, milk and parsley together in a jug. Season with salt and black pepper. 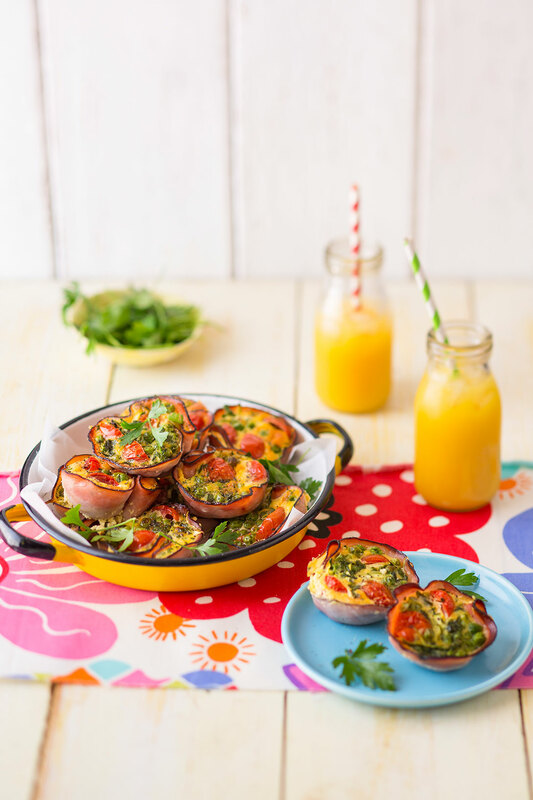 Divide the egg mixture carefully between the muffin cavities covering the ingredients. Top with Melrose Sweetmilk Wedges. Bake in the oven for 15 - 20 minutes or until golden brown and puffed up. Serve warm or at room temperature.